Lorenzo Mauldin had a difficult life growing up, but had football to lean on. The day before signing day, South Carolina decommitted from him. He ended up with Louisville where they used his unique set of skills as a pass rushing specialist. He had 22 tackles, 4.5 sacks, and 6.5 TFL in 2012 as a defensive end. In 2013 Lorenzo was involved in a hit and run while riding his moped to school, but still managed to start a full slate of games that year and had 41 tackles, 14 TFL, 4 forced fumbles and 10 sacks. He’d be moved to linebacker in his senior season but was equally as successful with 51 tackles, 13 TFL, and 6.5 sacks in 2014. 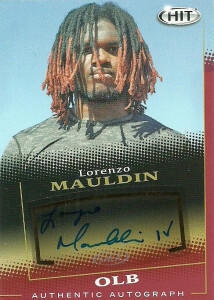 Scouts loved Mauldin. He could’ve given up at anytime, but he just developed the belief that the worst has already happened so nothing can stop him stop him now. Lorenzo applies this by working extra hard and putting in the extra effort. He’d move up draft boards and eventually be selected by the New York Jets in the 3rd round of the 2015 draft with the intention of utilizing him as a pass rush specialist. During the season, Lorenzo sustained a concussion that left him momentarily unconscious. He ended up completing his rookie season with 17 combined tackles, 4 sacks, and 1 forced fumble as a rotational linebacker behind Calvin Pace and Quinton Coples, while also contributing on special teams. Coach Todd Bowles remained optimistic about Lorenzo’s future with the Jets, saying that Mauldin could develop into a full time linebacker. Lorenzo started 3 games in 2016, lodging 16 combined tackles, 2.5 sacks, 2 passes defended, and an interception, but his 2017 was an unmitigated disaster. After off the field issues arose, Mauldin was placed on IR with an undisclosed back injury. Time will tell as Lorenzo faces stiff competition entering 2018 to make the Jets roster.